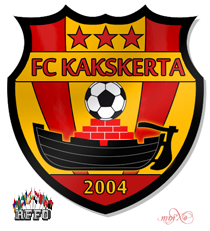 FC Kakskerta (258404) was found in the beginning of season 24. Manager of the team is jhattara. The team started playing in VI.833 in Suomi and was promoted to V.92 for the season 35. The first match was a second round cup match against a now defunct paras tem ending in a 1-3 defeat. Eerikki Löytöläinen scored the first goal of Kakskerta in the 19th minute. First victory came few days later in the first league match of FC Kakskerta starting a long term rivalship against FC Baatsi. In the 16 meetings between the two teams Kakskerta won eleven and Baatsi five times. The rivalry ended as FC Baatsi was demoted after season 31. Other major rivalries in VI.833 included FC Linnanmaa (1-2-5) playing in VI.833 through seasons 26 to 29, AC Burt (10-2-5, seasons 22-32), FC Tabasco (2-2-4) (seasons 29-32), and Kalevan Dynamo (4-3-1) (seasons 31-34). Home arena of FC Kakskerta is 2X Stadium. It can house 56,000 spectators: 31,500 in terraces and 24,500 seats of which 9000 are under roof and 1500 are in VIP boxes. In addition to being home of the club, the grounds also serve as the base of Kaksoispiste, the fan club of FC Kakskerta, consisting of almost 2500 members. The youth club of FC Kakskerta is Kakskerta Academy. It was found in the beginning of season 32 and plays its games in 2X Training Grounds, a training arena right next to 2X Stadium. Most of the players are also junior members of Kaksoispiste trying to catch a glimpse of their heroes at every opportunity. First choice keeper for the most of his career in Kakskerta spanning almost six seasons. For more than five seasons this set pieces specialist was one of the backbones of FC Kakskerta's success. Long term first choice wingback finally retired after playing 161 matches. This trustworthy defender and set pieces specialist was gradually pushed out of the first team as FC Kakskerta strengthened their defense. He held for a long time the club record for having played 51 first team matches in a row. Today he works as a TV-commentator for local sports channel. During his career in FC Kakskerta he was the most active player in the team. For almost four seasons he played in every first team match of FC Kakskerta, finally missing a league match because of too many bookings. His impressive and almost unbeatable records include appearances in 114 first team matches, 60 league matches, 22 cup matches (almost 7 cup runs) and 45 friendly matches in a row. Although he got his share of bookings he was never sent off from a match. Playing the first nine seasons in his home team, he was one of the most influential players of the team. Of the 11 seasons he spent in Kakskerta he was the first choice midfielder for 9 seasons. When he left the club he held the clubs records for most cup matches played and most yellow cards received. Although he played most of his career as a forward, Arsi excelled as an offensive midfielder. This powerful Belgian was for a long time the co-striker with team captain Roope Kuokka. He is one of the most efficient scorers of FC Kakskerta by scoring a staggering 70 goals in just 76 matches. One of the most successful forwards of FC Kakskerta. In his 43 league matches he scored an astounding 40 goals, almost 1 per match. In cup matches he was even more dangerous scoring one goal for each match he was fielded. This page was last edited on 20 November 2015, at 02:05.